The Queen’s Beasts Series is a newly introduced coin series of ten coins that features the heraldic beasts that stood guard at The Queen’s coronation. Released in both gold and silver editions, the coins will each depict each one of the The Queen’s Beasts, re-imagined by Royal Mint Coin Designer Jody Clark. Since its’ release in 2016, the series has become very popular with investors appreciating the exquisite designs at bullion prices. The third beast is the Dragon which is expected to be very popular around the world but perhaps especially so in Asia. The third beast is “The mighty Red Dragon of Wales“. In the crest, the beast holds a shield bearing a lion in each quarter; this was the coat of arms of Llywelyn ap Gruffudd, the last native Prince of Wales. 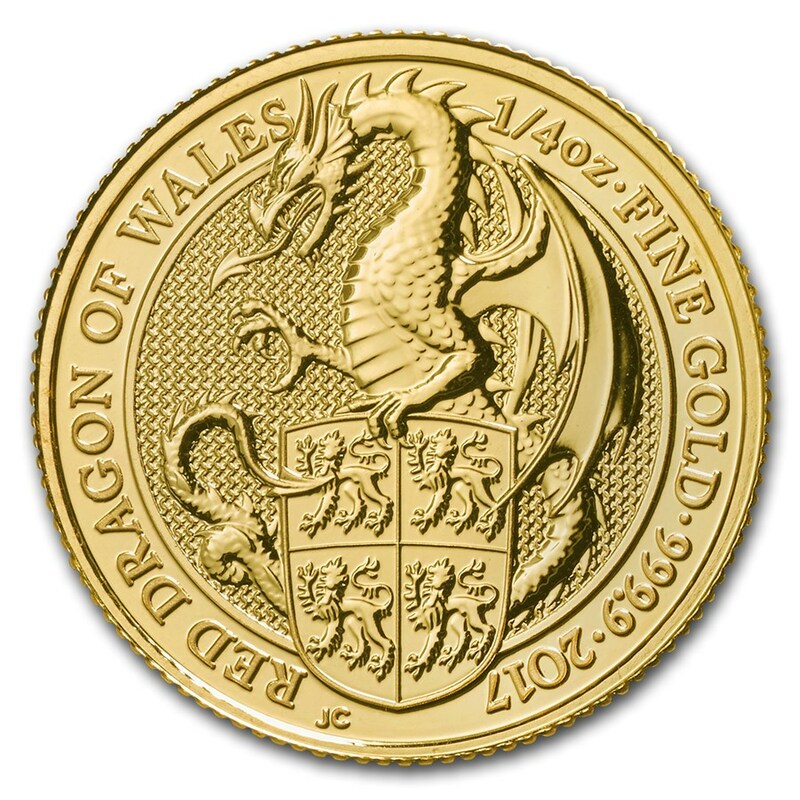 The Queen’s Beast Dragon is also available in 1/4 oz gold which is a handy size for collectors. This denomination also serves well as a gift which will keep its value over time. 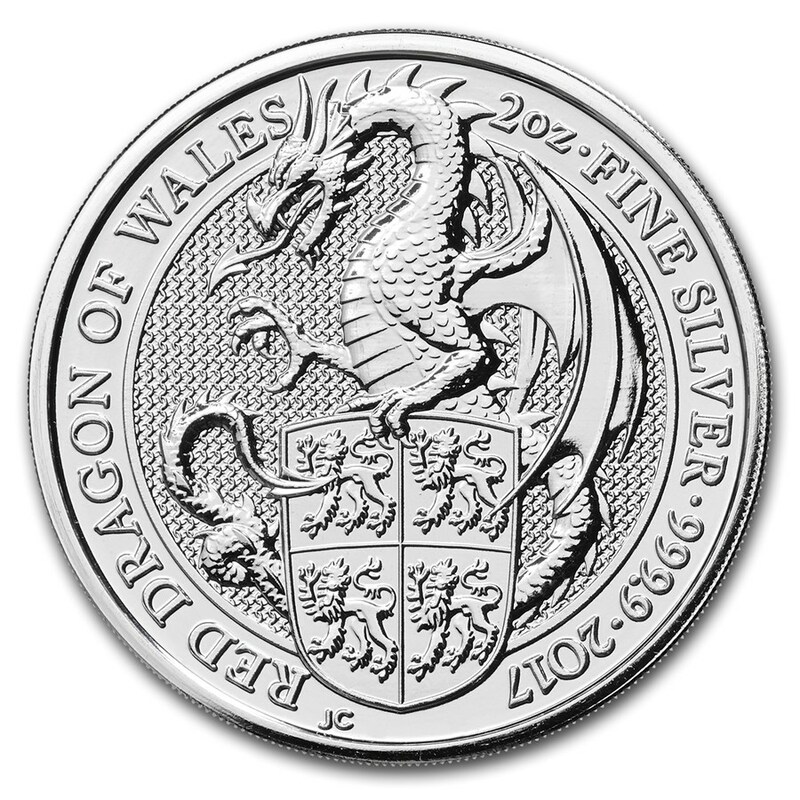 The Queen’s Beast Dragon is also available in 2 oz silver. The 2 oz silver coin is minted in .9999 fine silver and is legal tender at £5. The 2 oz Dragon silver coins are delivered in coin tubes with 10 coins in each tube. We expect demand to be very high for the Silver Dragon.